It’s a lifestyle website made with an entertainment twist specifically made for all of us who love Life and have Style. 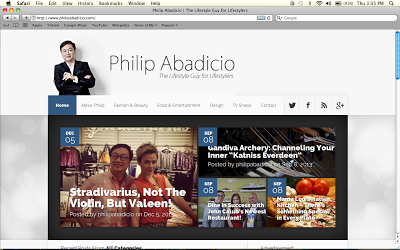 The Lifestyle Guy’s website for Lifestylers, Philipabadicio.com keeps us in-the-know on the must-knows in the lifestyle and entertainment scenes. By walking and talking the lifestyle beat for many years, Philip Abadicio brings an effortless familiarity and outspokenness into his website. This website is poised to give you a whole new lifestyle experience with entertainment segments on fashion, artists, celebrities, etc. "I work with the best team to put together our show plus all my insights and personal comments on the things we do,” says Philip. Today’s society operates at breakneck speed and thus, traditional forms of gathering knowledge are rapidly becoming obsolete. More often than not, the internet spews out breaking news ahead of the rest and most of us access this thru our social media accounts. Entertainment has also invaded our lifestyle choices. Philipabadicio.com brings to us the art and style of living with more in-depth information on some of the feature stories on Philip, Lifestyle Guy. Philip Abadicio is now taking his next big journey with Philipabadicio.com to bring forward his expertise in lifestyle to the audience that really matter: the general public. It is a visually appealing, culturally enriching, and gastronomically appetizing site with artists and celebrities. Prizes can also be won online similar to how it’s done on the TV show and as our lifestyle guy says it: “We’ll give you the surprises, for you to win the prizes!” The food that we recommend from the restaurants we feature, spa and salon treatments, frocks and froufrou from designers, gift cheques for stays at recommended hotels and resorts, consumer products and services, and a whole lot more, will be given away online. Philipabadicio.com will turn your life and style to slicker speeds than ever before! To access everything new and hip and cool, the method is simple, simply follow Philip Abadicio on Twitter- @philipabadicio, Instagram- @philipabadicio, and Facebook- Philip K. Abadicio. StyleRPA is a new media company and is the publisher of Philipabadicio.com. It delivers lifestyle news to equip readers with essential information about arts, culture, motoring, gadgets, fashion, beauty, wellbeing, food, entertaining, travel, events, design, advocacies and people. It’s the Lifestyle Guy’s Site for Lifestylers!